Thanks to a demo last night at one of the genealogy group I belong to I learned of a great new resource for Maryland. If you have ancestors in New Cathedral Cemetery in Baltimore, there is great news for you! There is now a burial database available for FREE! Let’s take a really quick tour. To access the burial database head over to https://www.newcathedralcemetery.org/. Next, on the top menu bar on the right side of the page, select Genealogy>Research Your Past. Next, scroll down to the Free Basic Search. Now you are ready to search. You will notice in the image above the first name in the list is Edward L Henry. In reality the first listing is for Albert J Henry. However, the column headers are static, they do not move when you scroll the list. So, when scrolling, be sure to scroll all the way up! Notice there is more information to the right. I know that because of the scroll bar. Currently it does not look like wildcards work when searching. You can only search by name, not by Section, Lot, etc. Remember to pay attention to those in the same lots, even if they have a different name. Maybe a search of the Baltimore Sun for those people will yield some new information. Although I have not spent an extended amount of time searching the database (yet), I am excited to get in there and dig in. So, search the new database and have fun! Evernote Premium Has Changed My Life! My relationship with Evernote has been a tumultuous one. I first started using it about 5 or so years ago. I HATED IT. I found it a little hard to use and didn’t really see an advantage of using it, so I stopped. Later, I saw a few webinars about using it for genealogy and once I saw some examples, I decided to give it another try and I quite liked it. I had a free account but it served my needs just fine. I even did a presentation about how great Evernote was at one of my local genealogy discussion groups! Then Evernote changed the rules for a free account. I could no longer use Evernote on my 2 laptops, a desktop, a phone and a tablet at one time. Now I was limited to 2 devices. Booooo Evernote. I was NOT going to pay pretty much for the ability to use more devices, especially when I had another option. I subscribe to Microsoft Office 365, so I have a TB of space to use with OneNote. So I figured I would just switch to OneNote. One of the advantages of OneNote (besides being able to use it on 5 devices) was the ability to use my Apple Pencil on my iPad Pro directly in OneNote to write notes on my uploaded PDF files from meetings or seminars. With Evernote, I had to use another app outside of Evernote (I used Penultimate) to add those handwritten notes. So, I exported all my notes from Evernote, imported them into OneNote and tried for about 6 months to use OneNote. It was OK, but I just didn’t like OneNote as much. I really did like Evernote better. I liked Evernote’s tagging, the ability to easily create a table of contents note without a 3rd party app and just the overall organization. There weren’t huge differences between the two but the differences were enough to make me go back to Evernote. I reinstalled Evernote and used the free version again. Ultimately I decided that I would bite the bullet and pay for Evernote. I chose Premium for the ability to search and annotate PDFs. Now that I had a larger monthly upload limit I decided to upload all of the newsletters and quarterly publications from the various societies I belong to into Evernote. I previously had them in Google Drive. The Evernote searching capability within my PDFs makes it well worth the subscription price for me! Author Aunt Barb's PapersPosted on April 29, 2017 Categories UncategorizedTags evernote, genealogy, softwareLeave a comment on Evernote Premium Has Changed My Life! There is a fun little exercise going around many of the Facebook groups this week. I’m calling them “Place” pedigree charts because I’ve seen them for birth places, death places and marriage places. The idea is to create a pedigree chart that color code your ancestors locations for births, deaths, or marriages. Basically, you could do it for anything you wanted, cause of death, burial locations, etc. This morning I did two of them, one for births and one for deaths for five generations. I knew that mine would not have the colors of the rainbow like some I’ve seen but mine are BORING!!! I created my charts using Excel. 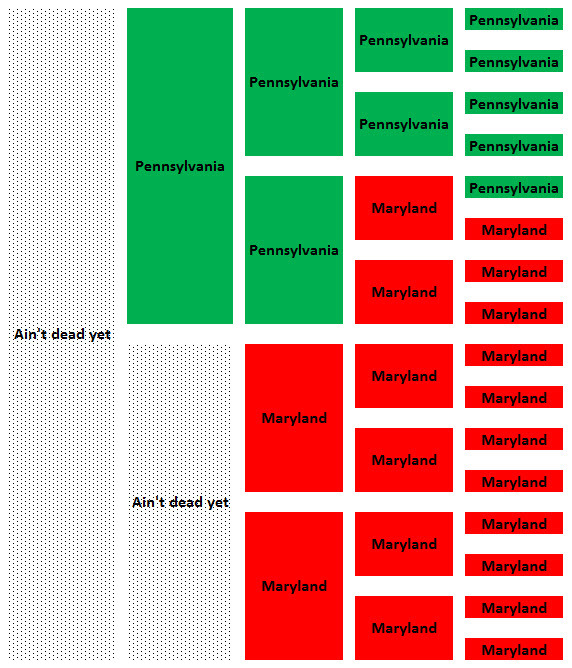 I used conditional formatting to easily color code the cells. Are You Using Chronicling America? If You Had Germans in Baltimore, MD…You Should! One FREE resource that has been very valuable to me is from the Library of Congress, Chronicling America: Historic American Newspapers site. This post will cover some basic information for the site and an example of the value of using the site. If you aren’t familiar, Chronicling America provides information and content for historic newspapers in the United States. Information about newspapers – One of the cool things on the site is the U.S. Newspaper Directory, 1690-Present. 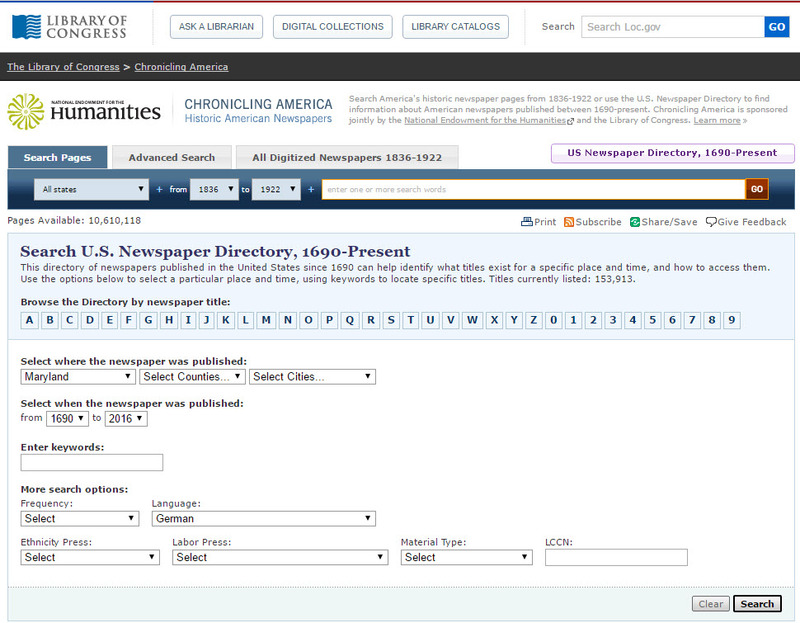 This allows you to identify U.S. newspapers by locations and dates AND how they may be accessed. As of the writing of this post, there are 153,913 newspaper titles listed. The directory search allows you to search by various fields such as state, date, language, keywords, etc. For example, I want to find information on what German newspapers were published in Maryland. 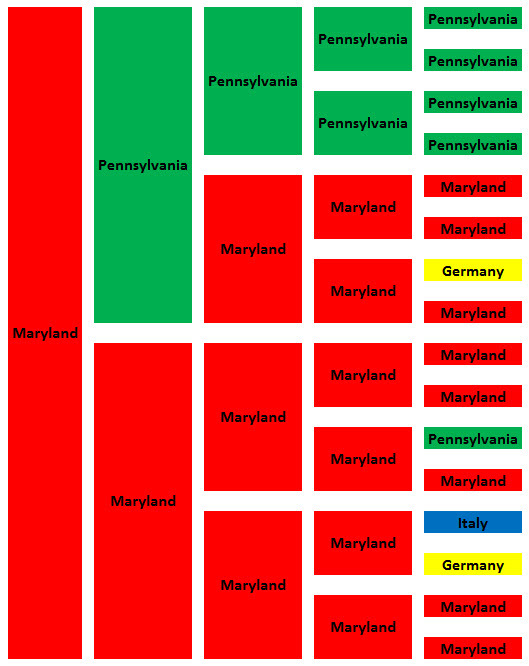 I have a lot of German ancestors that immigrated to Maryland and many remained in Baltimore. Content – The other cool thing on the site is the content. They have free, yes FREE digitized historic newspapers from 1836 to 1922. Disclaimer: They do not have all newspapers, nor do they always have entire published date range for a particular paper. As of the writing of this post, there are 10,610,118 digitized pages available. 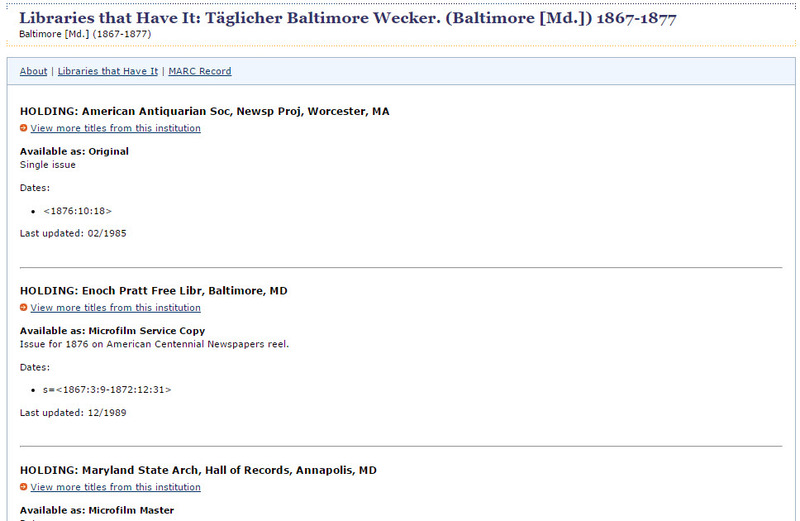 For example, I want to see what digitized German newspapers are available for Maryland on the site. Next, we will look at an example of why I LOVE this site for my research. Let it be noted that I am lucky in that “Der Deutsche correspondent” covers the location and time period that I am interested in. 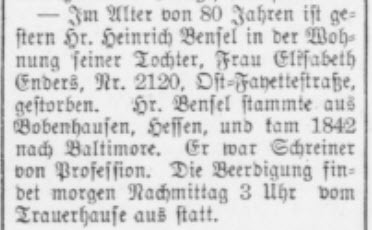 As I said previously, I have many German immigrant ancestors that came into Baltimore and decided to stay in Baltimore City, so it is very possible that “Der Deutsche correspondent” may have articles about my ancestors. So for my example we are going to look at my 3rd great grandfather Heinrich Bensel. I first found the exact death date for Heinrich in June of 2004. I narrowed his death down by searching using the U.S. Federal Census and the Baltimore City Directories and headed to the local library to search microfilmed newspapers starting in 1898. Finally in the July 19, 1898 edition of the “Baltimore News“. I found 2 articles. BENSEL – Died. Monday, at 6:15 P.M., after a short illness, HENRY BENSEL, aged eighty years and five days. The funeral will take place from the residence of his daughter, Elizabeth Enders, Wednesday, 20th inst., at 3 o’clock. Mr. Henry Bensel died yesterday morning at the home of his daughter, Mrs. Elizabeth Enders, 2120 East Fayette street. He was born July 13, 1818, in Germany. He emigrated to this country in 1847, two years later marrying Miss Mary Stocker. He was a skillful carpenter, at one time being in the active service of the Baltimore and Ohio Railroad until he was put on the pension list. His wife died on April 2 of this year. Two children survive him. They are John Bensel and Mrs. Enders. 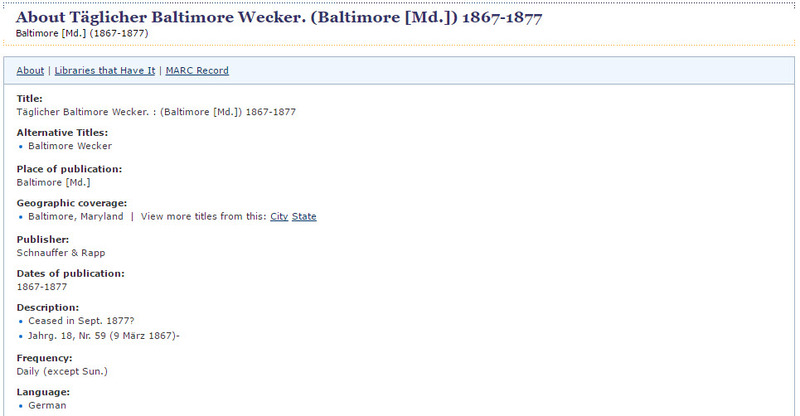 A few months later I went to the Maryland State Archives and got his death certificate. There wasn’t much more information except that his “short illness” was thermic fever that he had for 4 days. That is all the information I knew until I decided to search “Der Deutsche correspondent”. 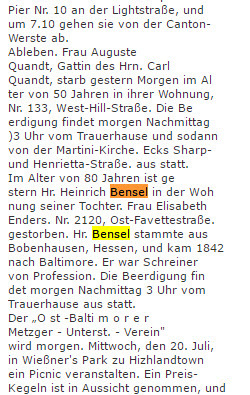 I searched Maryland papers for “Heinrich Bensel” and came up with several results around the date of his death. First, I saved and filed the PDF file to my computer. Next I highlighted the area of the text I wanted and did a Ctrl +C to copy the text. You will see that this article does not give me any more information than I already had. Actually, there is some conflicting information. Did he come to Baltimore in 1842 like the German paper said, or 1847 like the American paper said? I tried the same process for translating the article in Google translate and no matter how much massaging I did I just couldn’t get a good translation. Since I don’t read German, I cannot recognize all of the OCR mistakes that the article may contain. No worries, there are plenty of resources to help with the translation. My first stop will be social media. In my case, that worked. I took a screenshot of the article and headed over to the Genealogy Translation group on Facebook. This is a closed group but it has been so very helpful to me in translating documents. The burial of Mr. Heinrich Bensel, who passed from this life on Monday at the age of 80 years in the home of his daughter, Mrs. Elisabeth Enders, 2120 East Fayette St., occurred yesterday afternoon from the mortuary to the Loudon Park Cemetery. 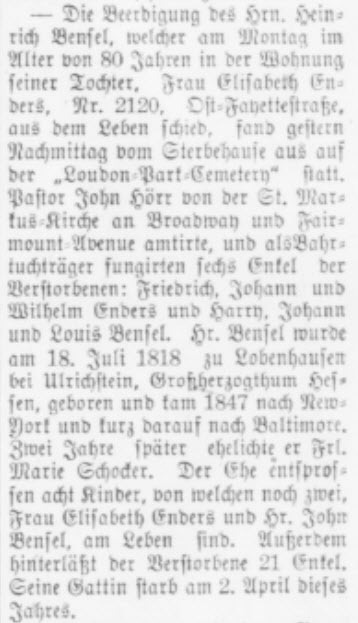 Pastor/Reverend John Hörr from St Martus Church on Broadway and Fairmount Avenue officiated, and six grand children of the deceased acted as pallbearers: Friedrich, Johann and Wilhelm Enders and Harry, Johann and Louis Bensel. Mr. Bensel was born on 18th July 1818 in Lobenhausen near Ulrichstein, Grand Duchy of Hessen and came to New York in 1847, and shortly thereafter to Baltimore. Two years later he married Miss Marie Stocker. The marriage produced 8 children of which two, Mrs. Elisabeth Enders and Mr. John Bensel, are still living. Also surviving the deceased are 21 grandchildren. His wife died on the 2nd of April of this year. This gave me so much more information to start looking at. I now have a church name to search records for, children to double-check to make sure I have them all, grandchildren to check (names and number of grandchildren). I also have an immigration city and and location of birth. I always assumed he came directly to Baltimore and I could never find his immigration information, Now I know I need to check New York. This article is the only place that gave me an exact location of birth. Had I not been able to get an answer within the translation group, my next step would have been to reach out with local societies that I belong to to see if anyone within the society could help. I have had success with that in the past. 1. Check out Chronicling America. 2. For your immigrant ancestors, take some time to investigate foreign language newspapers. 3. See if Google Translate can help with foreign language translation. 4. Seek help with translations from social media or local societies. Author Aunt Barb's PapersPosted on March 18, 2016 April 2, 2017 Categories UncategorizedTags Baltimore City, Bensel, Enders, genealogy, Library of Congress, maryland1 Comment on Are You Using Chronicling America? If You Had Germans in Baltimore, MD…You Should! If you have been considering doing a DNA test with Ancestry, please use my referral link to order a DNA kit at a 10% discount. Personally, I have been tested through Ancestry.com and have also tested several family members. The test is easy to take and attaching the results to my tree has allowed me to connect to several cousins and helped further my research. My ethnic breakdown was a little surprising as I am much more “Viking” than German, and by testing other members of my family I have been able to separate out the ethnicities a lot easier. I have also been able to narrow down matches quicker than if I had just tested myself. In addition, by testing the oldest member of my family (my since deceased 93 year old great aunt), I have been able to make connections that didn’t show up strongly for me. Since she is 2 generations closer to my ancestors, some matches that were on the 8th or so page on my matches were on the 1st or 2nd page of hers. So, what are you waiting for? Click below to get 10% off an Ancestry DNA test through my affiliate link. I JUST Bought Family Tree Maker 2014…What? Unless you have been under a rock for the last month you know that ancestry.com announced that as of December 31, 2015 the sale of Family Tree Maker was being discontinued. The software will still be supported until January 1, 2017. I use Legacy Family Tree as my desktop genealogy software and I do not plan on changing that. I have used it pretty much since I started genealogy and I like how it works. But, I recently read a blog article on The Ancestry Insider entitled “Why Buy Family Tree Maker While You Can?” The reason made sense to me. I have several trees on ancestry.com, both public and private. I use them mostly for “cousin-bait” and collecting hints. Because ancestry.com does not interface directly with Legacy Family Tree (and I am OK with that) and I don’t upload and download trees a lot, I have never found a reason to take a look at FTM. However, I do see the need to maybe “backup” my on-line tree. One advantage of FTM is that it will download the sources attached to your tree, something not possible with a standard GEDCOM download of an ancestry tree. Now, that one advantage was not worth the full price of $70 for FTM software. But, I did find FTM 2014 on Ebay for $22, so I pulled the trigger. To me $22 is worth a year of being able to sync what I have now to make sure grab all the sources I have collected on my ancestry.com trees. I also think the ability to generate a temporary tree for some of my “Genealogy Go-Over” families will be advantageous. I have also closely watched recent posts on Facebook from FTM refugees who have adopted Legacy and how their FTM converted files import into Legacy. And if it doesn’t work out the way I think (hope) it will I am only out $22. Author Aunt Barb's PapersPosted on January 2, 2016 Categories UncategorizedTags Family Tree Maker, genealogyLeave a comment on I JUST Bought Family Tree Maker 2014…What?